Dunkirk director Christopher Nolan talks about the similarities between casting Harry Styles and casting Heath Ledger. Harry Styles was chosen from more than 100 auditioning actors for the part of Alex, a British soldier in Nolan's World War II suspense-thriller based on the Battle of Dunkirk. 22-year old Styles recently left the insanely popular boy band One Direction to forge a solo career and this will be his first substantial movie role after some guest starring work on Nickelodeon shows over the years, usually portraying himself. 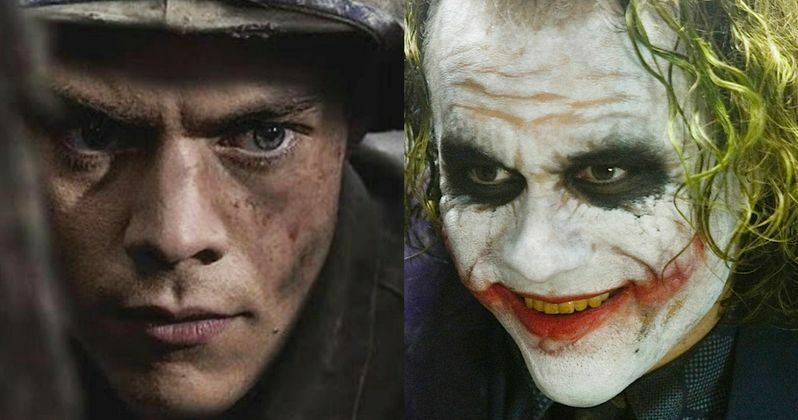 Christopher Nolan recently sat down with Entertainment Tonight where he compared the casting of Harry Styles in Dunkirk to the casting of Heath Ledger for The Dark Knight. In both cases, the actor was relatively unknown at the time in terms of Hollywood blockbuster movies. The director ultimately made the decision to cast both actors by following his instincts in both cases. Nolan explains. "When I cast Heath Ledger as the Joker (in The Dark Knight), it raised a lot of eyebrows and caused a lot of comment. I have to trust my instincts, and Harry was perfect for this part." The news comes after Nolan revealed that he wasn't aware of just how famous Harry Styles was at the time of his casting. And much like the casting of Heath Ledger for The Dark Knight, many, possibly many, many more raised their eyebrows when it was announced that a dude from One Direction would be starring in a Christopher Nolan movie. Nolan then went on to discuss why Styles got the part while most likely highlighting why Ledger received the part as well. Nolan said this. "I was new to Harry. I mean, I'd heard his name from my kids, but I wasn't really familiar with him. What I was seeing (when Styles auditioned) was a very charismatic guy who clearly had a truthfulness and a subtlety in his ability to perform as an actor." It is not clear just how big of a role that Styles will play in Dunkirk, but his presence is definitely giving the movie an extra bump in the social media department, with even some of the actors in the movie addressing the "hysteria" surrounding the inclusion of Styles in the movie. Fionn Whitehead who stars in Dunkirk has called all of the hype regarding Styles in the movie to be "rather silly," while going on to point out that Styles is a nice and talented guy, but all of the hype surrounding the casting choice is all a "bit silly really." Early reviews are starting to pour in for Dunkirk ahead of the July 21st premiere and they are overwhelmingly positive. Which means it looks like Nolan's instinct has proven to be correct yet again. Many people did not want to see Heath Ledger portraying the Joker, but he has arguably gone down in history as one of the best actors to put on the purple pants. The same might be said for Mr. Harry Styles, but for now we'll just have to sit back and watch. Styles might just be able to add great actor to his already impressive resume.